Records highest and lowest daily temperatures. Large easy-to-read face. Convenient push-button reset. 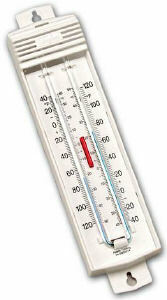 Temperature range -40°F to 120°F and -40°C to 50°C. Records highest and lowest daily temperatures. Large easy to read face. .Temperature range -40F to 120F and -40C to 50C.